ITH ENDLESS DEBATE about musical styles, the term “Liturgy Wars” is now a common part of the liturgical lexicon. So common, in fact, that it has lost its shock value to the point that it is in some circles not even controversial. It is an accepted reality. In some ways, this is a healthy sign because reasonable, intelligent people need to be able to work together even when they don’t agree. Or more commonly, we may have superiors with whom we must work with even if we believe (or know) we are correct, or backed by the Liturgy Documents, etc. Catechesis is a process. A working trust is a process. Often it takes years. More realistically, it takes a lifetime. The political reality in most every parish is that there are numerous “factions” and preferences. This requires the reality of doing many styles of music even in one liturgy. This has advantages and disadvantages—too many to discuss. But an important political reality is that when advocating for 100% purity of style or approach, one will usually leave the table with nothing. This helps no one. And the people may be cheated of ever being exposed to music that is their birthright—the Treasury of Sacred Music of the Church. CASE CAN BE MADE for a hybrid music program in which one may chose from the “best of the best.” In some circumstances, this is the only way to introduce chant or polyphony or traditional hymnody. In many parishes, regular use or even introduction of such music is progress. It also will be something to build upon. 1)	The Three Judgments — When selecting music, 2007 US Bishop’s document Sing to the Lord: Music in Divine Worship requires that we consider three elements when choosing music: 1) Liturgical 2) Pastoral 3) Musical. I wrote a good deal more about this here. Does the music fulfill these requirements? This is an essential guideline that will help filter out lesser music, and direct our hearts and minds toward God. 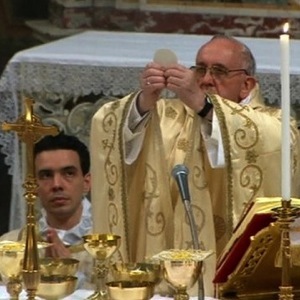 2)	In the liturgy, the Word is preeminent. From a liturgical perspective, it is vital to note the text of the music. All too often, the particulars of text are not considered carefully enough or at all. What is the theological content? Is the text from scripture? Is the text a setting of any of the antiphons? Different styles can go a longer way when the text correlates to the words of the Mass in this manner. 3)	When rehearsing music of different styles, pay a high level of attention to universal musical principles: phrasing, diction, choral blending, etc. Apply all of these regardless of the style. It will also earn the respect of the choir, the people, and the pastor. 4)	Music of all styles for the liturgy must be filtered through the prism of reverence. Reverence does not preclude energy or joy or any other emotion for that matter. In fact reverence embraces all emotions. But, the sacred liturgy requires it. If a piece cannot be reverent in some fashion, then it is probably not appropriate for the liturgy. It is our job to make sacred music work. Some music requires more input and effort from us to make that happen. It’s our pastoral responsibility to do so in order to serve God and to serve His people. 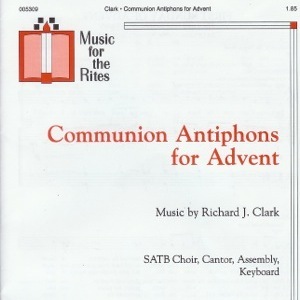 Hard copies and downloadable digital scores of the Communion Antiphons for Advent, published with World Library Publications. You can listen to recordings directed by Paul French here.